You are probably thinking, WTF?! 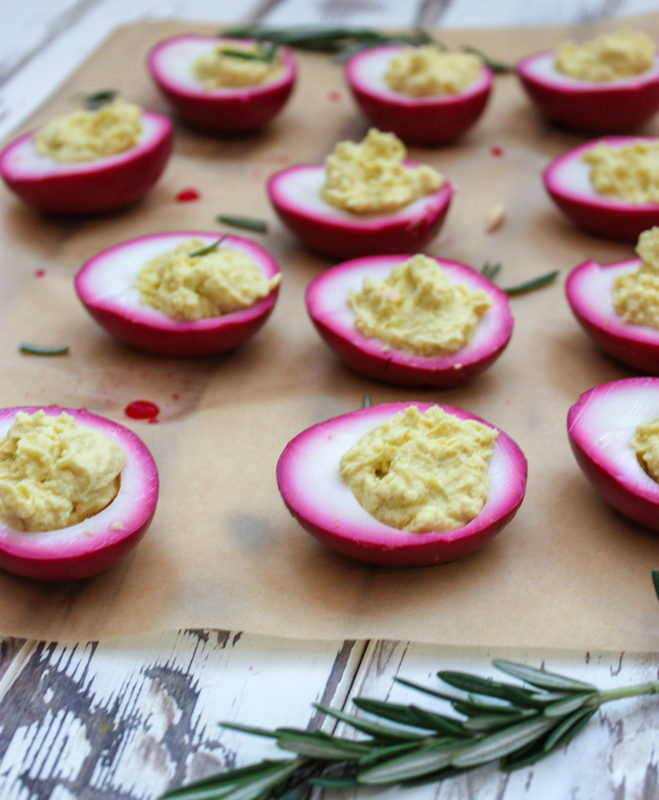 Why are these deviled eggs pink, right? 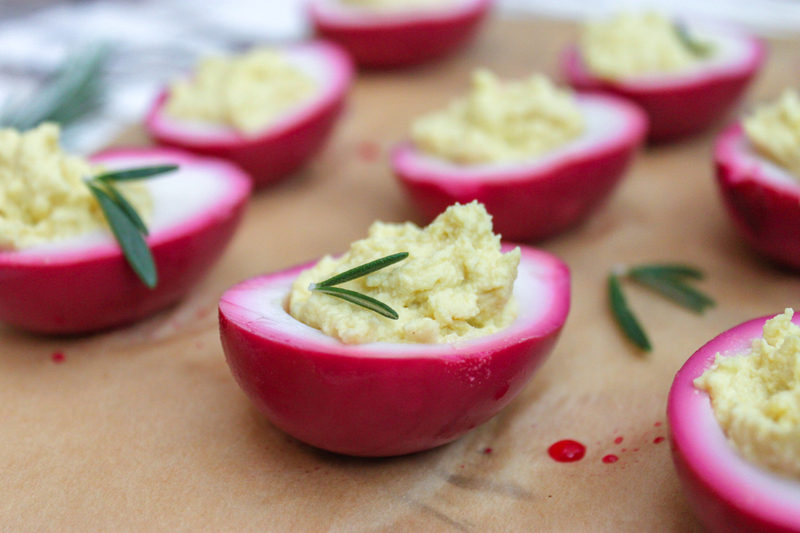 Well, this recipe is sorta like a martini deviled egg. 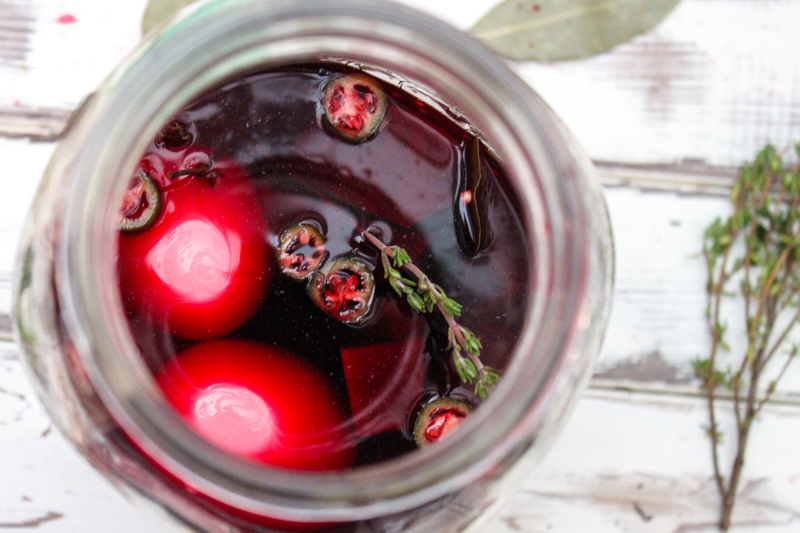 The eggs are pickled (using a beet-based brine) and then vodka is added to the filling. Bring 3 cups water, 1 peeled beet, a clove of garlic, 2 tablespoons brown sugar, a bay leaf, tablespoon peppercorns, 1 cup vinegar, 1/4 teaspoon anise seed and 1 teaspoon salt to a boil, then simmer covered for about 20 minutes until the beet is tender. Let mixture cool completely. At the same time the brine is cooking, carefully place the eggs in another sauce pan and fill the pan with enough water to cover the eggs by 1-inch. 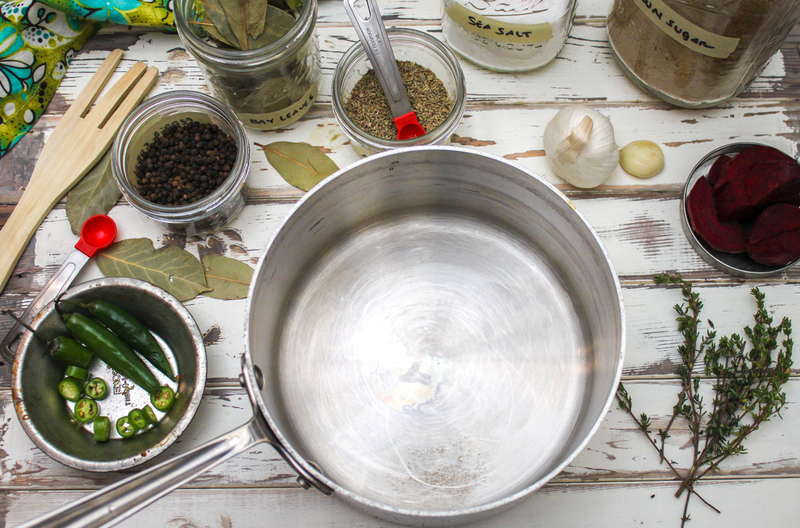 Bring the water to a boil over a medium-high heat. Once it is boiling, turn off the heat and remove the eggs from the stove. Cover them and let them sit for about 20 minutes. To stop the eggs from over cooking and turning the yolk gray, empty the hot water and replace it with cold water. You can even add ice. 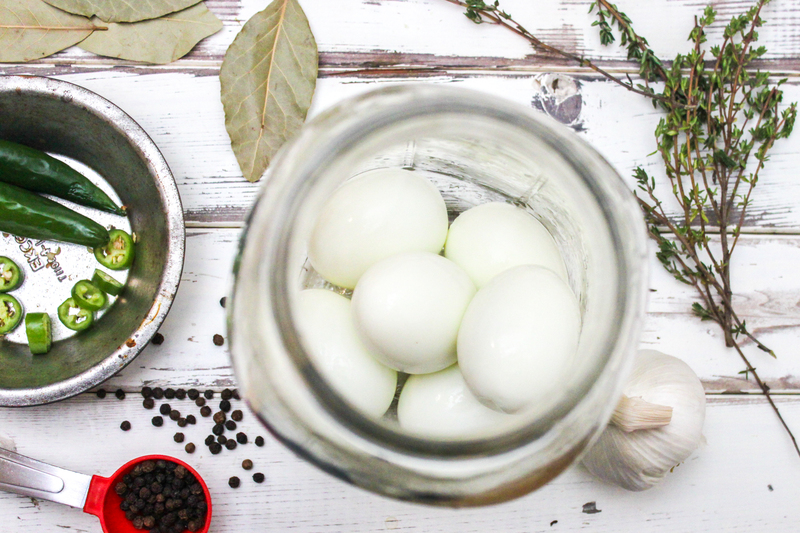 Place the eggs and brine in a container now adding the fresh thyme and serrano chiles, seal it and chill it in the refrigerator, stirring every few hours. 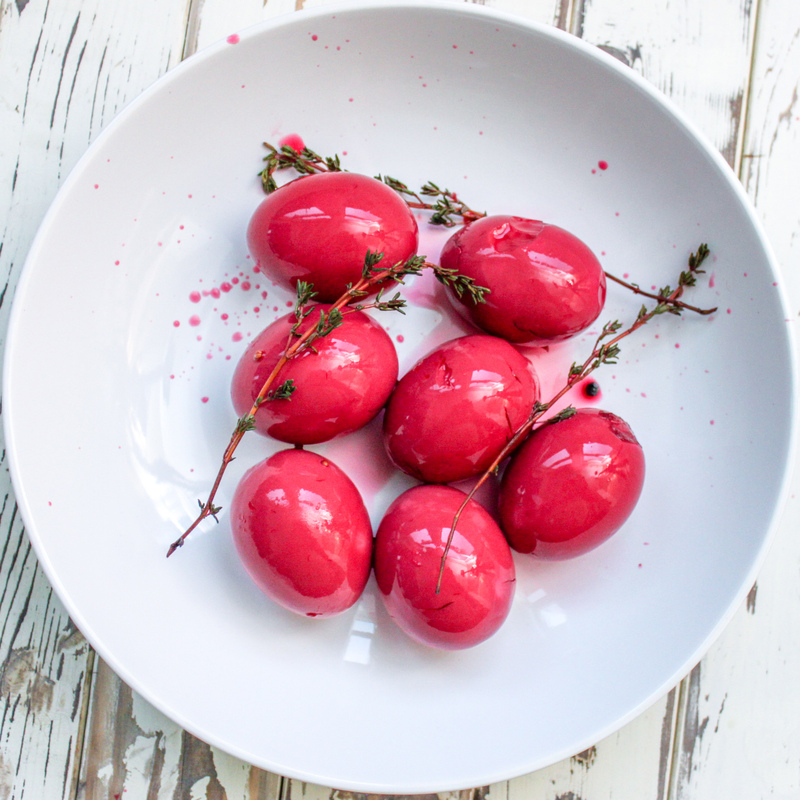 Depending on how pickled (and pink) you want your eggs, let them sit for at least 10 hours. When brining is finished, cut each egg in half and scoop out yolks. 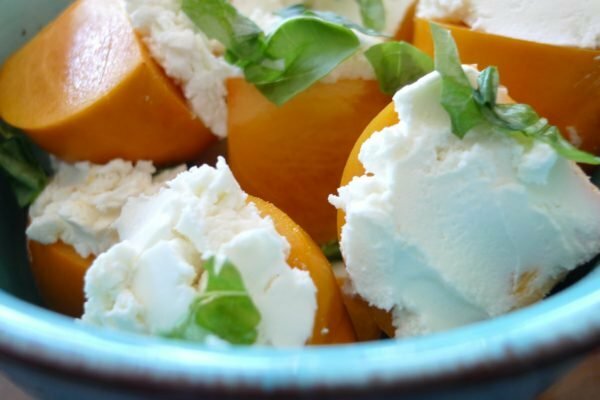 Place yolks in a medium-sized bowl, along with the tablespoon mustard, tablespoon mayonnaise, teaspoon vinegar, and 2 tablespoons olive oil. Mix/mash until smooth. Add the 1/8 teaspoon salt but salt to taste. Be careful here, it is really easy to over salt deviled eggs. I would work the salt in portions at a time and taste as you go. Add in 1/4 of the vodka and mix well. The key here is to make them super boozy but not liquify the yolk mixture. If the consistency holds, add in the remaining vodka, 1/4 at a time. 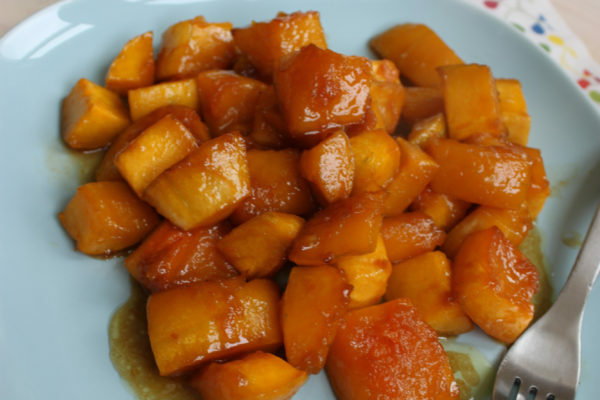 In fact, you can add more if your yolks allow it. This is variable because of the egg size. 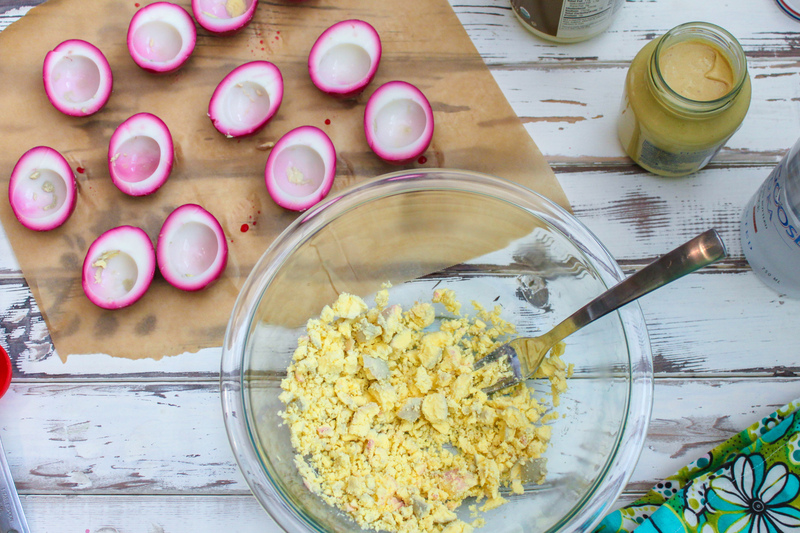 Using a pastry bag or a plastic bag with the corner cut off, pipe the yolk mixture back into the pink eggs. Sprinkle with chopped rosemary and chill.